Having seen Jeremy in action for over 15 years, I can testify to the integrity, energy, high level connections, real time knowledge of govt/industry, unrelenting competence of Jeremy King as a businessman and executive recruiter.As a former Acting Secretary Air Force and Chairman of several companies/associations now, I have seen firsthand how he differs from the competition. If you want the best, full spectrum performance, you want Benchmark. Mr. McCoy is a senior executive with over 25 years of experience at the highest levels of government and the private sector. 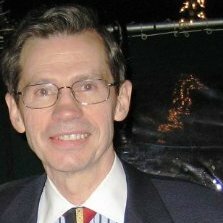 He has planned and executed major doctrinal changes, multi-billion dollar programs, legislative support activities, association creations, and company strategic financing initiatives as a senior executive within the United States Air Force, the Department of Defense, the aerospace industry and the venture capital community. As a dedicated professional, he has served with distinction at the highest levels within the legislative and executive branches of government, and has received Presidential, Defense and Air Force Secretarial and Congressional recognition for his accomplishments. Mr. McCoy is the Founder, Chairman, and CEO of Washington Capital Partners, LLC, a Venture Capital firm focused on early stage investing in technology companies that seek breakthroughs in business models, products, processes, and management. He placed investments in some fifteen companies, leading the firms efforts in discovery, due diligence, negotiations, governance, milestones, alliances, path to market, recruitment and exits. Prior experience in private equity before founding Washing Capital Partners included: Founder, Vice Chairman, and Chairman of the Investment Committee of the George Washington National Bank of Alexandria and served as an Advisor on an $ 890M acquisition in Joint Venture with the Carlyle Group. Previously, Mr. McCoy was Vice President for Government Relations for Thiokol Propulsion where he developed an effective and comprehensive government relations program that considerably strengthened Thiokol as an aerospace company within the NASA and Defense contractor community. His efforts on behalf of the Company with Congress and the then-serving administration resulted in creating opportunities for Thiokol to successfully compete for strategically significant NASA business that led to a period of unprecedented growth and value-creation for the Company. He was a key participant in the formulation of the Thiokol strategy for developing a new, large solid rocket motor to deflect and defeat proposals for an expensive and potentially dangerous liquid rocket motor alternative for the Space Shuttle; and led the strategy for a team where Thiokol was a major subcontractor in winning a multi-billion dollar Minuteman ICBM Contract. Earlier, Mr. McCoy served as Assistant Secretary for Manpower, Reserve Affairs, and Installations and later Assistant Secretary for Readiness Support (Installations, Logistics, and Readiness). As the Senior Assistant Secretary he was the senior civilian official during the modernization and rearmament of the USAF during the Reagan Administration. During this time, he served on the Air Force Systems Acquisition Review Council, the final review authority prior to approval by Secretary of the Air Force for all major acquisition programs (multi-hundred and multi-billion dollar programs), which reviewed the management, cost, schedule, and performance of systems. In this capacity, he oversaw some $50B in appropriated funds. His responsibilities included recruitment, training, promotion policies, diversity, morale, ethics, retirement, housing, energy, environment, construction, readiness, and many other matters through direct and constant contact with civilian and Air Force colleagues. Other previous positions of service include Member of the Professional Staff, Senator Jake Garn and the Senate Defense Appropriations Committee; Director of Policy Research, Office of the Under Secretary of Defense for Policy; Scientific Assistant to the Assistant Secretary of the Navy for Research, Engineering and Systems; Deputy Assistant and Staff Assistant to the Secretary of Defense; Member of the Professional Staff, National Security Council, The White House; and Officer, United States Army. Mr. McCoy received his Bachelor of Science Degree in Engineering from the United States Military Academy, West Point, in 1967, and a Master’s Degree in Business Financial Management from George Washington University in 1975. He was awarded the Bronze Star for his service in Viet Nam, and other military medals while on active duty as an officer in the United States Army; and, as a civilian, Medals for Extraordinary Service by two different Secretaries of Defenses and the Secretary of the Air Force. They found the perfect candidate in the first two weeks. He is the impact player we were hoping to land.